Colebrook Buffet The Colebrook buffet embodies casual design at its finest. The plank door fronts, antiqued brass-finished hardware and rustic oak finish have a country chic look that's easy to design with. And you won't lack for storage space—3 drawers and adjustable, removable interior shelves house your table linens, extra dishes and dining accessories. The Colebrook buffet embodies casual design at its finest. The plank door fronts, antiqued brass-finished hardware and rustic oak finish have a country chic look that's easy to design with. And you won't lack for storage space—3 drawers and adjustable, removable interior shelves house your table linens, extra dishes and dining accessories. Maximum Weight Capacity: 537 lbs. Absolutely beautiful oak finish. There is lots of storage space, a nice felt-lined top drawer and adjustable interior shelves. Very good quality with a pleasant shopping experience. We have many pieces from Raymour & Flanigan and like them all! Just had mine delivered today,and loving it! 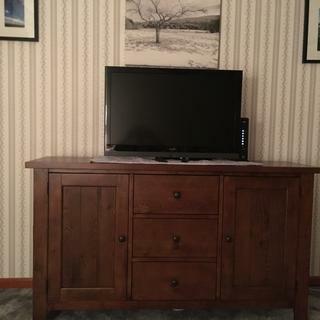 Has a lot of storage, and it fits beautiful in my living room. I purchased the Colebrook at the Waterbury store and I absolutely love it. This is the second piece I’ve purchased. What is the backing of the cabinet? BEST ANSWER: The backing is some type of fiberboard. It isn't finished wood.